That’s because the 78-million strong Baby Boom is in the driver’s seat of American politics. It plainly will not permit the $3 trillion per year retirement and health care entitlement-driven Welfare State to be curtailed. The Trumpite/GOP has already sealed that deal by refusing to reform Social Security and Medicare and by proving utterly incapable of laying a glove politically on Obamacare/Medicaid. At the same time, boomers keep voting for the GOP’s anti-tax allergy, thereby refusing to tax themselves to close Washington’s yawning deficits. More importantly, the generation which marched on the Pentagon in 1968 against the insanity and barbarism of LBJ’s Vietnam War have long since abandoned the cause of peace. So doing, boomers have acquiesced in the final ascendancy of the Warfare State, which grew like topsy once the US became the world’s sole superpower after the Soviet Union slithered off the pages of history in 1991. Yet there is a reason why the end of the 77-year world war which incepted with the “guns of August” in 1914 did not enable the world to resume the status quo ante of relative peace and prosperous global capitalism. Consequently, it burst into a quest for unadulterated global hegemony. In short order (under Bush the Elder and the Clintons) Washington morphed into the Imperial City, and became a beehive not only of militarism, but of an endless complex of think-tanks, NGO’s, advisories and consultancies, “law firms”, lobbies and racketeers. It thrives and metastasizes by abandoning the republican verities of non-intervention abroad and peaceful commerce with all the nations of the world in favor of the self-appointed role of global policeman. Rather than homeland defense, the policy of Empire is that of international busybody, military hegemon and brutal enforcer of Washington’s writs, sanctions, red lines and outlawed regimes. After all, it hasn’t violated the nuke deal (JPAOC) by the lights of any credible authority—-or by even less than credible ones like the CIA. Nor by the same consensus of authorities has it even had a research program for nuclear weaponization since 2003. Likewise, its modest GDP of $43o billion is equal to just eight days of US output, thereby hardly constituting an industrial platform from which its theocratic rulers could plausibly menace America’s homeland. Nor could its tiny $14 billion defense budget—which amounts to just sevendays worth of DOD outlays—inflict any military harm on American citizens. These are all deemed by Washington to be sources of unsanctioned “regional instability” and Iran’s alliances with them have been capriciously labeled as acts of state sponsored terrorism. 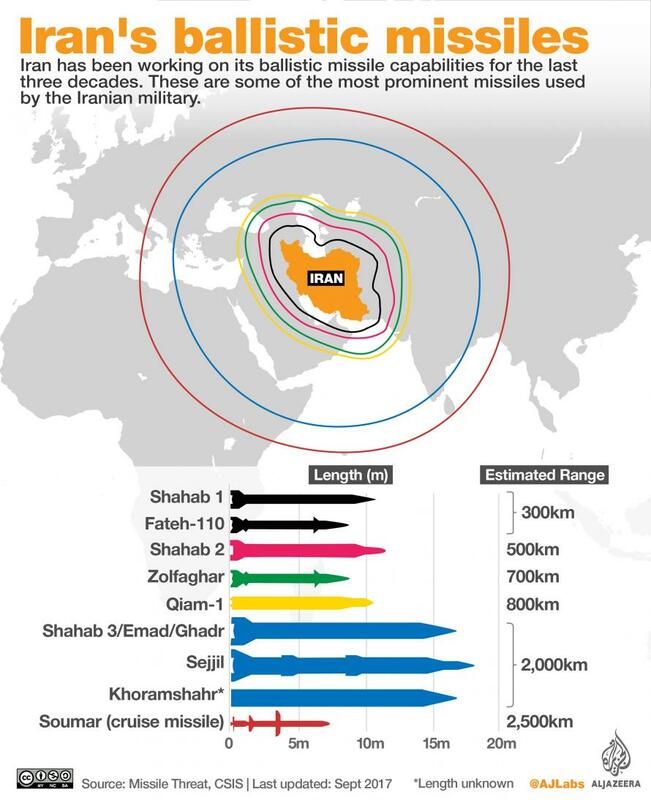 The same goes for Washington’s demarche against Iran’s modest array of short, medium and intermediate range ballistic missiles. These weapons are palpably instruments of self-defense, but Imperial Washington insists their purpose is aggression—–unlike the case of practically every other nation which offers its custom to American arms merchants. How did the historic notion of national defense morph into Washington’s arrogant claim that it constitutes the “Indispensable Nation” which stands as mankind’s bulwark against global disorder and chaos among nations? Thus, Washington started the Ukrainian confrontation by sponsoring, funding and recognizing the February 2014 coup that overthrew a Russia-friendly government with one that is militantly nationalistic and bitterly antagonistic to Russia. It re-opened deep wounds that date back to Stalin’s brutal rein in Ukraine and Ukrainian collusion with Hitler’s Wehrmacht on its way to Stalingrad and back. Even more hideous is the rhetorical provocations and Seventh Fleet maneuvers ordered by Washington with respect to China’s comical sand castle building in the South China Sea. Whatever they are doing on these man-made islands, it is not threatening to the security of America—nor is there any plausible reason to believe that it is a threat to global commerce, either. Indeed, so long as Imperial Washington is stretched about the planet in its sundry self-appointed missions of stabilization, “peacekeeping”, punishment, attack and occupation, there is zero chance that America’s collapsing fiscal accounts can be salvaged. But Empire is a corrosive disease of governance. It eventually metastasizes into imperial arrogance, over-reach and high-handedness. Ultimately, like at present, it falls prey to the rule of bellicose war-mongers and thugs. Yes, the feinschmeckers of the foreign policy establishment consider economic sanctions to be some kind of benign instrument of enlightened diplomacy—the carrot that preempts resort to the stick. But that is just sanctimonious prattle. When you hound the deep water ports of the planet attempting to block Iran’s oil sales, which are its principal and vital source of foreign exchange, or cut-off access by its central bank to the global money clearance system known as SWIFT or pressure friend and foe alike to stop all investment and trade—that’s an act of aggression every bit as menacing and damaging as a cruise missile attack. But Ike did so because he was old-fashioned enough to believe that even penetrating the air space of a foe without permission was an act of war—- and that he did not intend, the CIA’s surveillance program notwithstanding. Today, by contrast, Washington invades the economics space of foreign nations with alacrity. In fact, the US Treasury Department’s Office of Foreign Asset Control (OFAC) proudly lists 30 different sanctions programs including ones on Belarus, Burundi, Cuba, Congo, Libya, Somalia, Sudan, Venezuela, Yemen and Zimbabwe—along with the more visible programs against the alleged malefactors of Iran, Russia and North Korea. More pointedly, the Indispensable Nation meme originates not in the universal condition of mankind and the nation-states into which it has been partioned, but in the one-time, flukish and historically aberrant circumstances of the 20th century that gave raise to giant totalitarian states in Hitler’s Germany and Stalin’s Russia, and the resulting mass murder and oppressions which resulted there from. But as we will outline in greater detail in Part 2, Stalinist Russia and Nazi Germany were not coded into the DNA of humanity—a horror always waiting to happen. So you can put the blame for this monumental error squarely on Thomas Woodrow Wilson——-a megalomaniacal madman who was the very worst President in American history; and who took America into war for the worst possible reason—a vainglorious desire to have a big seat at the post-war peace table in order to remake the world as God had inspired him to redeem it. Indeed, the shattered world after the bloodiest war in human history was a world about which Wilson was blatantly ignorant. And remaking it was a task for which he was temperamentally unsuited—even as his infamous 14 points were a chimera so abstractly devoid of substance as to constitute mental play dough. America thus plunged into Europe’s carnage, and forevermore shed its century-long Republican tradition of anti-militarism and non-intervention in the quarrels of the Old World. From that historically erroneous turn—there arose at length the Indispensable Nation Folly ,which we shall catalogue in the balance of this series. It led to a peace of vengeful victors, triumphant nationalists and avaricious imperialists—-when the war would have otherwise ended in a bedraggled peace of mutually exhausted bankrupts and discredited war parties on both sides.